Antarctica truly is the polar continent, as it has resided over or near the South Pole since Gondwanan supercontinent times about 350 million years ago. Scientists traverse across sea ice in the southwestern Ross Sea. Ongoing research in the Antarctic is investigating past climate changes through ice core records. Image courtesy of Ross Powell. Antarctica has had previous ice sheets, but its current one is thought to have been Earths only ice sheet for more than half of the Cenozoic Era, starting at least 34 million years ago. This stability makes Antarctica the most ancient ice sheet in the world, compared to the much younger ice sheet covering Greenland and the North American and Eurasian ice sheets, which are only a few million years old. Today, the Antarctic Ice Sheet is about 10 times larger than the ice sheet that covers Greenland. It contains 65 percent of the worlds freshwater, which if melted, is a volume that could raise sea level by more than 70 meters (230 feet). Antarctica therefore plays a fundamental role in sea-level change and ocean chemistry, and has the potential for important societal impacts over human timescales. The Antarctic Ice Sheet and surrounding ice shelves and sea ice are also thought to play a significant role in global climate by influencing the amount of energy Earths surface absorbs from the sun, as well as the circulation of the atmosphere and oceans. The frigid temperatures and high elevations of the ice-covered continental interior produce a steep equator-to-pole temperature gradient, which is the driving force of winds and ocean currents. Many fundamental aspects of Antarctic climate, geology and the evolution of its biota remain unknown, as do their interactions with the rest of the globe. Certainly, modern geologic, glaciologic, atmospheric and oceanographic research can contribute data directly to monitoring the pulse of the ice sheet, ice shelves and sea ice. However, paleo-records are also key, by providing insight into how the ice sheet may have reacted to past climate change. Ice cores have provided some of the best paleo-records from ice sheets, but although very useful, these records only extend back in time as far as the oldest ice preserved at the base of the ice sheet, thought to be up to 1 million years old in the Antarctic. Older records require geologic data, but obtaining long geological records proves challenging in Antarctica, due to 99.6 percent of the continent being covered by the ice sheet. Hence, the geologic drilling that was first started offshore by the Deep Sea Drilling Project and onshore by the Dry Valley Drilling Project in the 1970s continues to be now and in the future the primary source of deep-time paleoclimatic data (see story, this issue). The new ANDRILL (ANtarctic geological DRILLing) Program, funded by the National Science Foundation (NSF), is the next step, aiming to extend Antarctic paleoclimate records through time intervals that are thus far poorly sampled in Antarctica, while also providing information on the tectonic history of the continental margin. Today, the Southern Ocean surrounding Antarctica is the worlds only system in which mixing occurs between water masses from all ocean basins. The Southern Ocean is also the most biologically productive on Earth and plays key roles in global budgets of carbon and nutrients and the exchange of carbon dioxide between the atmosphere and the ocean via large-scale mixing processes. Antarctica has several important sites where cold water sinks and acts as part of the the driving wheels of the global ocean conveyor belt, which helps moderate the climate of the high latitudes. The ice sheet exerts a direct influence on the Southern Ocean, in part, through its influence on temperature and the strong, gravity-driven winds that blow down the ice sheet and out over the coastal ocean. These winds influence sea-ice formation and ocean mixing, which in turn influence atmospheric and ocean circulation processes. Thus, variability in Antarctic temperatures and the extent of glacial and sea ice affects climate systems throughout the globe. Consequently, many researchers believe it is critical to understand how the ice sheet will react to current and future global warming, as some of the predicted scenarios by the International Panel on Climate Change indicate that within a few centuries, greenhouse gas concentrations, most notably carbon dioxide, could be higher than when the ice sheets formed on Antarctica more than 30 million years ago. An urgent task for numerical ice-sheet modeling is thus to assess the vulnerability of the major modern ice sheets to future climate changes. ANDRILLs investigation of past variations of the West and East Antarctic ice sheets, the two components of the Antarctic Ice Sheet, will help validate these models and also tell us directly what ice-sheet responses to expect for given types and amounts of climate change. Previous large-scale modeling of the paleo-Antarctic Ice Sheet has concentrated on the basic response of the East Antarctic Ice Sheet to changes in surface snowfall and additions or losses of ice volume in the Cenozoic (past 65 million years). The modeling suggests relatively minor recession of the terrestrial East Antarctic Ice Sheet, with greater likely vulnerability of the marine-based West Antarctic Ice Sheet. The potential for drastic West Antarctic Ice Sheet retreat is not well understood because accurate modeling requires a challenging combination of understanding different flow regimes  ranging from floating ice to ice streaming  and understanding how the ice sheet moves on a layer of water and deforming sediments. Geological drill cores from the Antarctic margin provide direct evidence of the past extent and variation in size of the Antarctic Ice Sheet and associated oceanic and sea-ice processes. Scientists can compare data from these cores to what is known from elsewhere about major events that affected the world during the Cenozoic, such as ocean circulation changes, warming and cooling trends, and sea-level changes. It thus becomes possible to evaluate the connection between the changes in Antarctica and those in the rest of the world. Data from ANDRILL will facilitate high-resolution ice-sheet and sediment models, driven by larger-scale climate and continental ice-sheet models, and apply them to the region. And detailed comparisons with the core data will enable validation of the models and a unique opportunity to improve understanding of the interactions among sea level, climate, sediment accumulation and changes in the ice sheet  all filling an urgent need to better predict the vulnerability of West Antarctic Ice Sheet to climate change. ANDRILL is an international program including about 170 scientists from the United States, New Zealand, Italy and Germany. 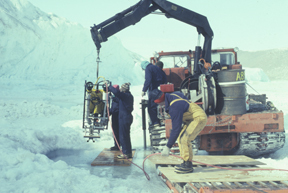 The program has upgraded a drilling technique adopted from previous drilling efforts, in which mining drill rigs were modified for drilling sea ice. With a core recovery rate greater than 95 percent in the types of materials encountered on the Antarctic continental shelf, this drilling technology performs significantly better in Antarctic locations than other techniques used by the Ocean Drilling Program farther offshore on the continental slope and other locations. Researchers deploy a remotely operated vehicle (ROV) through sea ice in the southwestern Ross Sea to investigate the chemistry of the chilly waters. Image courtesy of Ross Powell. ANDRILLs new drilling rig successfully passed a recent drill test in New Zealand after being customized to work from both sea ice and ice shelves in Antarctica. The rig can lower 2,000 meters of drill string through holes in the ice. For ice shelves, a custom-designed hot water drilling system first melts an access hole through the ice and then the geological drill string is lowered through it. This technology enables the collection of paleo-ice-sheet and paleoclimate records from areas that otherwise are inaccessible. Two projects within ANDRILL aim to recover records from different geological time periods and thus address slightly different scientific questions. The McMurdo Ice Shelf Project will begin drilling this October and will last approximately two months. The Southern McMurdo Sound Project will start one year later, and both projects are located near the U.S.-operated McMurdo Station and New Zealand-operated Scott Base. The McMurdo Ice Shelf Project will look at past responses of the floating Ross Ice Shelf and grounded West Antarctic Ice Sheet to a range of climate forcings over various timescales, as environments have changed with the growth or decay of the ice sheet over the past 5 to 10 million years. To reach this goal, ANDRILL will drill into a 1,200-meter-thick body of Pliocene-Pleistocene glacial, marine and volcanic sediments that are rich in remains of fossilized marine life. The sediments have accumulated in the Windless Bight region within a trough around the still-active volcanoes forming Ross Island. The trough in Earths oceanic crust around the island has formed over the past several million years as the volcanoes grew in size and locally weighed down the crust. The project will recover a single 1,000-meter drill core from the troughs axis in approximately 900 meters of water. 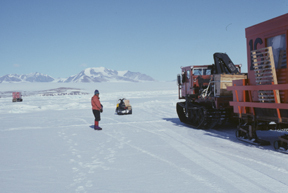 Sediments recovered from this core will be used to determine when the site was open water, or when it was covered by sea ice, the Ross Ice Shelf or the West Antarctic Ice Sheet. At present, scientists have little direct evidence of changes through time for this part of the Antarctic Ice Sheet, which some believe is potentially quite sensitive to climatic and sea-level changes. In contrast, the Southern McMurdo Sound Project is targeting middle Miocene to Pliocene deposits with some thinner younger deposits (approximately 17 million years ago to present), which accumulated in a sinking tectonic basin generated by faulting on the margin of the Victoria Land Basin in the western Ross Sea. The project is primarily trying to establish a robust history of growth and decay of the East Antarctic Ice Sheet and associated sea-ice changes during the Neogene from about 17 million years ago up to about 2 million years ago. Currently, scientists have windows of time in which they know what has happened with this part of the Antarctic Ice Sheet, from the preserved sediments recovered from previous drilling efforts. The new drilling will hopefully fill some of the critical time gaps when the history of the ice sheet is not well-defined or known at all. The project may also shed more light on the debates about how active the East Antarctic Ice Sheet has been in the past. Understanding such past behavior can help scientists understand how the Antarctic Ice Sheet may behave during current and future global warming. In addition to ANDRILL, which the United States sees as a major contribution to the International Polar Year (2007 to 2008), the U.S. geoscience community recognizes that other data are important to geoscientific research on the geological history of Antarctica. A number of geoscience initiatives oriented toward paleoclimatic problems have evolved from recent NSF workshops. One such initiative, the SHALDRIL (SHALlow DRILling) project, aims at ship-based coring along the Antarctic continental margin. It will provide access to sedimentary records lying beneath the sea-ice zone, between where ANDRILL is looking and the continental slope where more traditional ship-based drilling platforms can be used. Another project still in its planning phase is called FASTDRILL (FAST ice sheet DRILLing), which is aimed at developing a mobile drilling system capable of rapidly drilling local- to continental-scale arrays of deep boreholes through the entire 3- to 4-kilometer-thick Antarctic ice sheet. This project will allow unprecedented access to the glacial and subglacial environments that are of growing multidisciplinary interest to geologists, glaciologists, biologists and paleoclimatologists. This effort will potentially allow access to subglacial lake environments to investigate life in deep ice and subglacial environments, as well as access to paleoclimate records that are locked in lake sediments. The latter would be the first deep-time paleoclimate records from well within the continental interior of Antarctica. Recent advances in remote sensing, autonomous and remotely operated vehicles (AUVs and ROVs), and new geochemical and biogeochemical analytical techniques are also providing a wealth of new data and opportunities for important discoveries. Several new U.S. and international field programs using these new technologies are either currently under way or being planned. These data-gathering missions cover the full range of Antarctic environments, from the continental interiors to the near-shore/ice-shelf zone, continental-slope/sea-ice zone, and the more distal Southern Ocean. Although Antarctica is often forgotten or ignored by laypeople and politicians alike, due to its position as the worlds only polar continent tucked away at the bottom of the world, its massive size (about 1.5 times as large as the United States, including Alaska) and unique characteristics make it a major player in climatic and geological research. The future of this frozen mass of water has important societal ramifications that justify the need to drill back in time in Antarctica, to gain a clearer understanding of how the ice sheet is capable of behaving. A panel of experts for the National Academies National Research Council (NRC) is evaluating whether or not the U.S. Coast Guards fleet of polar icebreaking ships needs a makeover. For the short term, at least one of the ships will need to be revamped, or the U.S. Coast Guard will have to build a new one, according to the panel. The notion that the poles need a revamped icebreaker fleet to create ice-free passages to the Arctic and Antarctic may seem to contradict studies showing that environmental changes are reducing the extent of Arctic ice each summer (see story, this issue). But the fleet of three ships will be in higher demand than ever, as reduced ice will probably lead to expanded commercial and scientific ventures in polar regions. The Coast Guards current ships are either too old or ill-equipped to handle an increased demand for clear passageways, according to the congressionally mandated interim report released in December. The best short-term solution, the committee wrote, is to restore one of the ships and also to return budget authority to the Coast Guard. Currently, the Coast Guard and the National Science Foundation (NSF) share control over two heavy icebreakers, Polar Star and Polar Sea, which are primarily used to break a passage to research stations in the Antarctic, specifically, the McMurdo and South Pole stations (see story, this issue). Approaching their 30th year of service, the ships have outdated technology and increased maintenance needs, which place them at risk for operational failure, the committee reported. Long-term maintenance has been continuously postponed, the committee says, simply because of a lack of funding. Julie Brigham-Grette, a geoscience professor at the University of Massachusetts in Amherst and a member of the NRC committee, spent six weeks in 2003 aboard a third ship, the Healy, during its first geoscience mission to take sediment cores from beneath the Bering Sea (see Geotimes, January 2003). She says that at any time, the ship could have been called to abandon its scientific operations in the Arctic to assist with the Coast Guards other responsibilities. You have to think about icebreakers like you do a fire truck. When you need them, theyre there, Brigham-Grette says. Fortunately for Brigham-Grette, the Healy was not called away during her mission. However, the Healy, which was built for scientific support and not heavy icebreaking, has on occasion been called to abandon scientific support operations in the Arctic and head south to aid in breaking through to McMurdo Station in the Antarctic. Such a shift in station can jeopardize not only NSF- and Coast Guard-supported science missions, but also the Coast Guards other expanding Arctic missions, including search and rescue, maritime safety, and homeland security  underscoring the need for more ships, Brigham-Grette says. To meet icebreaking needs in both the Arctic and Antarctic, Congress asked the committee to recommend steps in time for planning the 2007 budget. For now, the committee recommended that one of the older ships be made mission capable, for between four and eight years  long enough to build a new ship. The advice, however, serves only as a short-term recommendation. The committee wrote that a final report is needed to justify a future for the icebreaker fleet that is consistent with the national missions for these ships. The full report is due out late this summer. Most of our work still lies ahead of us, Brigham-Grette says. The committee, she says, is still debating about whether the best long-term solution is to fix the old fleet or to build a new icebreaker. Powell, a principal investigator for ANDRILL, is a professor in the geology and environmental geosciences department at Northern Illinois University in DeKalb. E-mail: ross@geol.niu.edu. DeConto is in the department of geosciences at the University of Massachusetts in Amherst. And Pollard is at the EMS Earth and Environmental Systems Institute at Pennsyl-vania State University in University Park.